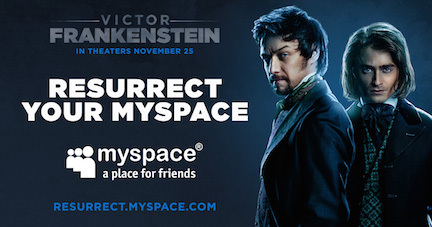 Victor Frankenstein is in theaters and to celebrate they have brought your MySpace account back to life. Victor Frankenstein starring Daniel Radcliffe as Igor and James McAvoy as Victor Frankenstein has dropped into a theater near you today. And to celebrate its release, Victor and Igor are performing another maddening experiment…they are resurrecting your old MySpace profile. To me this is quite funny because my MySpace days were filled with some of the most random encounters I’ve ever experienced. So to be able to go on now and resurrect my profile photo in the original MySpace template, and search for other friends’ profiles seems like it will be a hoot. I fully understand this promotion is an attempt to get folks to check out the new myspace.com. Let’s be honest it is a cute idea. So go and bring your MySpace account back to life here: Resurrect.MySpace.com. Remember Victor Frankenstein directed by Paul McGuigan, with screen story and screenplay by Max Landis is in theaters now. The film also stars Jessica Brown Findlay, Andrew Scott, and Freddie Fox.